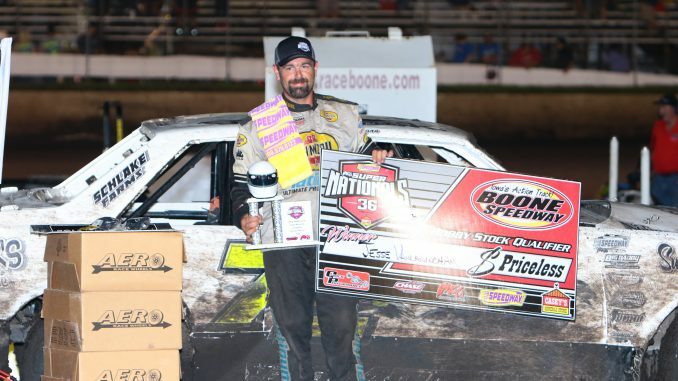 BOONE, Iowa (Sept. 3) – Jesse Vanlaningham will start from the pole in Saturday’s Hobby Stock main event at the IMCA Speedway Motors Super Nationals fueled by Casey’s. The Beatrice, Neb., speedster ran in front the last 11 circuits in winning Monday’s first qualifying feature at Boone Speedway, taking advantage when leader Craig Clift and a lapped car made contact after midway in the 25-lapper. Andy Hoffman chased Vanlaningham across the stripe in a fast-paced feature slowed only by a caution on lap three. Four-time and defending champion Shannon Anderson motored from 12th starting to third. The rest of the top eight advancing to the inside row on Saturday were Clift, Brandon Nielsen, James Johnson, Matthew McAtee and Kyle Parizek. Shawn Wirtz was disqualified from a transfer spot because of an illegal carburetor. Anderson qualified for his career 10th main event, Vanlaningham his sixth and Nielsen his fourth. McAtee and Parizek are both in for the second time while Clift, Hoffman and Johnson all are first-time qualifiers. 1st qualifying feature – 1. Jesse Vanlaningham, Beatrice, Neb. ; 2. Andy Hoffman, Sioux City; 3. Shannon Anderson, New Virginia; 4. Craig Clift, Sioux City; 5. Brandon Nielsen, Spencer; 6. James Johnson, Cherokee; 7. Matthew McAtee, Elkhart; 8. Kyle Parizek, Hartwick; 9. David Rieks, Eldora; 10. Matt McDonald, Scranton; 11. Brett Vanous, Quasqueton; 12. Jason Kohl, Missouri Valley; 13. Justin Luinenburg, Reading, Minn.; 14. Kaleb Jasperson, Pierce, Neb. ; 15. Jacob Floyd, Cedar Rapids; 16. Tyson Overton, Carlisle; 17. Cameron Wilkinson, Neligh, Neb. ; 18. Eric Knutson, Slater; 19. Allyn Myers, Broken Bow, Neb. ; 20. Dean Hartwig, Boone; 21. Jim Kimmel, Norfolk, Neb. ; 22. Rusty Gyles, St. Charles; 23. Adam Lee, Salix; 25. Solomon Bennett, Minburn; 26. Seth Butler, Scranton; 27. Jason Fusselman, Avoca.